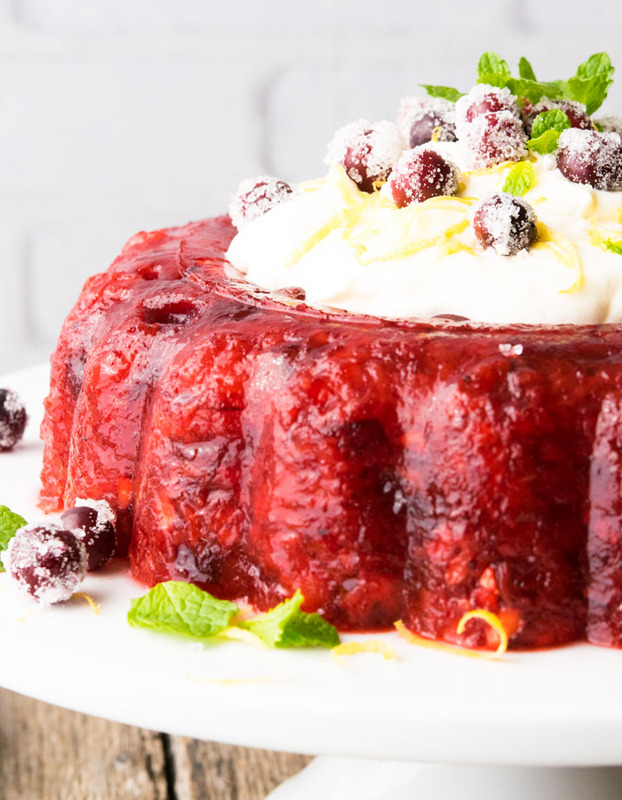 Our Cranberry Jello Salad Is Sweet And Tart With An Amazing Creamy Topping. 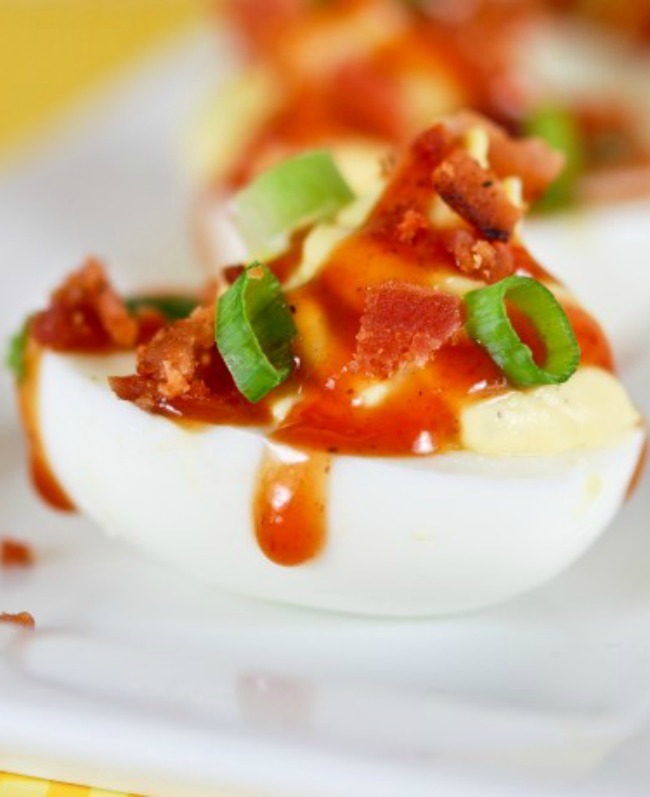 This Perfect Holiday Treat Might Create A Stampede To The Table! After two decades’ confinement to church basements, cranberry jello salad is once again in vogue! And I’ll be honest, it’s delicate flavors and fun forms have me wondering how it ever went out of style. 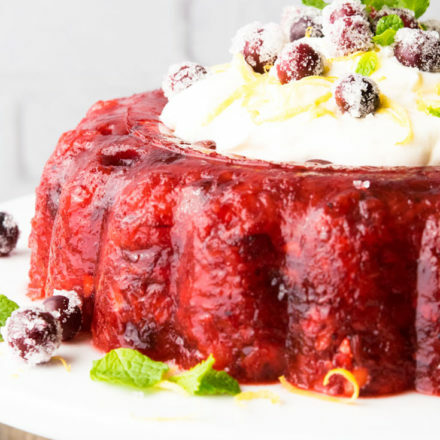 Nothing says “happy holidays” quite like cranberry recipes, and nothing says “my kitchen is entertaining!” quite like jell-o masterpieces! With cranberry pineapple jello salad, you get to say both. This delicacy is both festive and fanciful. 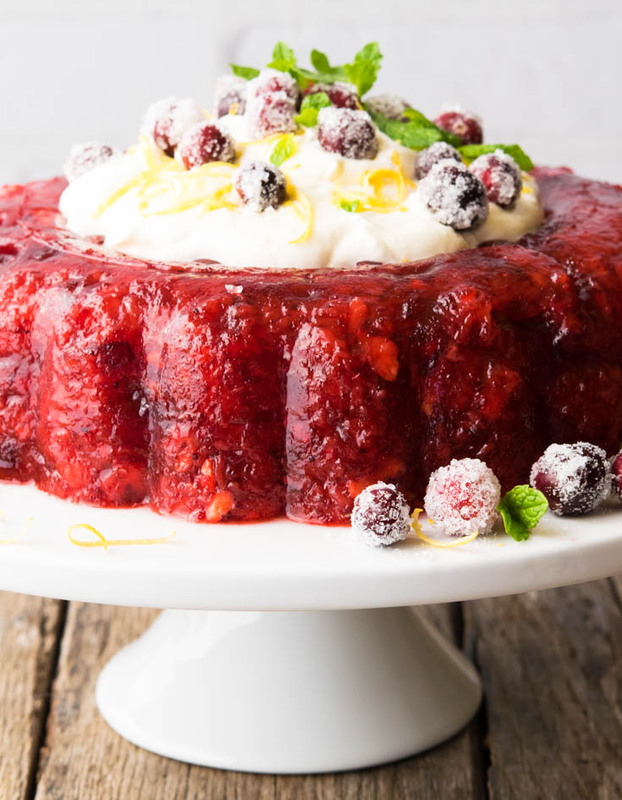 The lightness and coolness of cranberry jello salad make it a great option for summertime as well, so don’t hide it away in your December stash. If you are in the market for a unique, fun salad choice, check out my (whimsically named) Frog Eye Salad! Prep time is only 10 minutes! The flavor combo of our Lemon Cream Topping with the Cranberry Jello is AMAZING! What Is Cranberry Jello Salad? Cranberry jello salad with cream cheese topping is your destiny tonight, that’s what it is! A jiggly relative of Cranberry Salad and Watergate Salad, this awesome concoction translates well across all occasions. 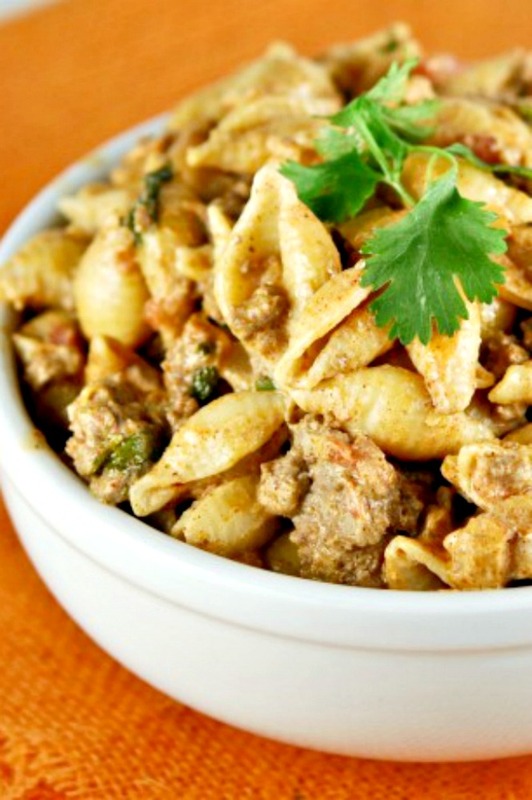 Serve it when the grandkids visit, church potluck, or make it your contribution to an otherwise dull work luncheon. 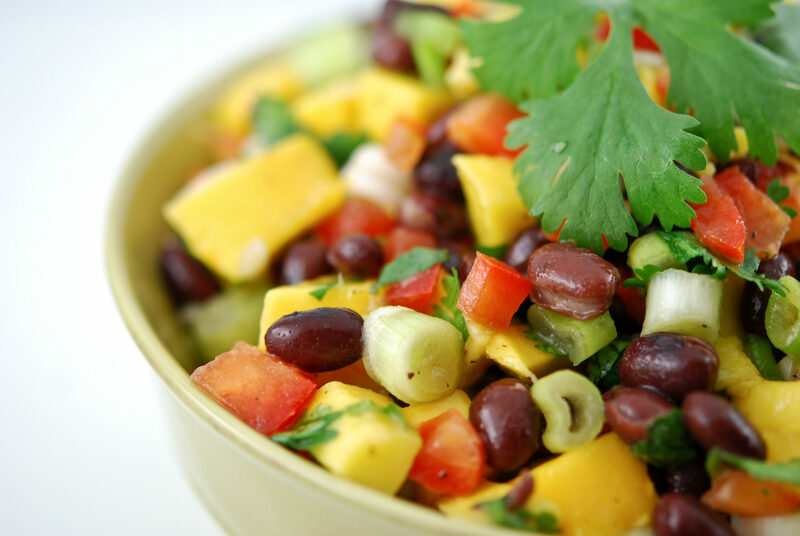 Composed of fruits and jello, and finished with a sweet creamy lemon topping, this is one salad that everyone will love! 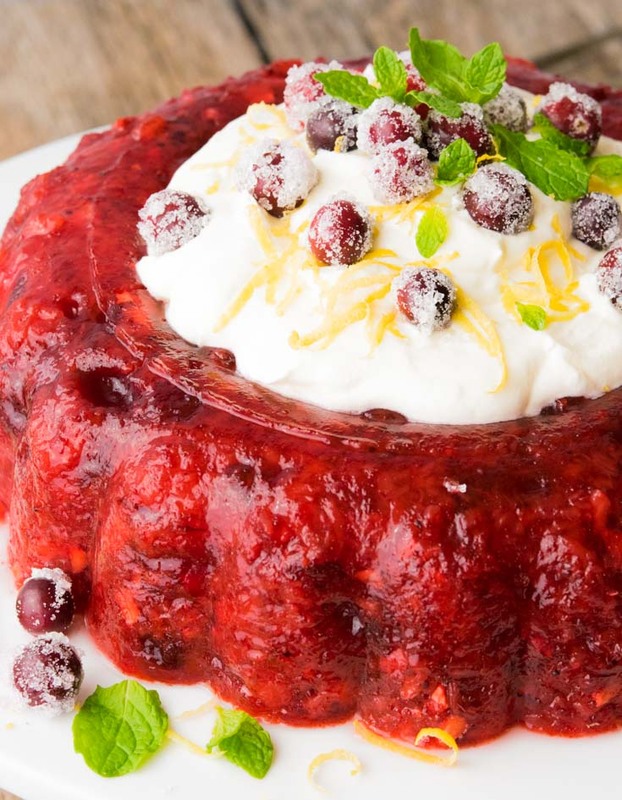 What Ingredients Do You Need To Make Cranberry Jello Salad? Cranberry salad with jello is an easy weekday treat, composed of few readily available ingredients. Just grab two packages of flavored jello and one envelope of unflavored gelatin for the “jello” portion of this recipe. For the “salad,” you will need a can of cranberry sauce (whole berry variety), a can of crushed pineapple (don’t discard the juice! ), one cored, peeled and chopped pear, and some walnuts. 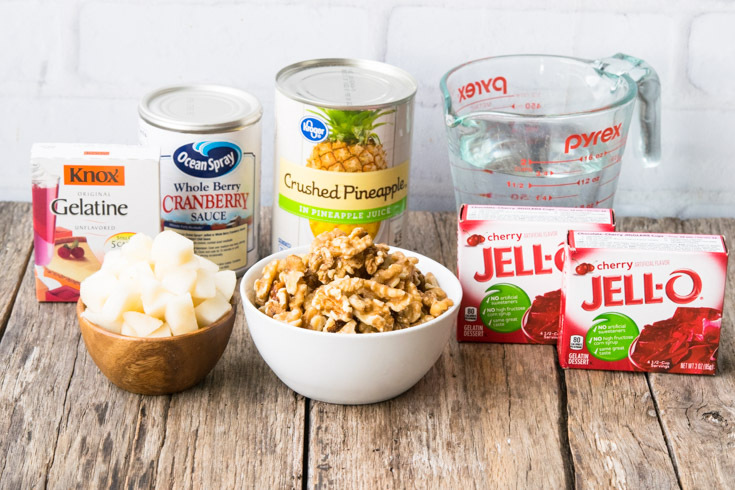 That’s all you need for jello salad — just add water! Now, this is a salad I can get behind. The topping is even simpler. With a package of cream cheese, a little whipping cream, some powdered sugar, lemon zest, and lemon juice For garnish, a handful of fresh cranberries or Sugared Cranberries, you are good to go! Deceptively simple to make, the whipped topping really pulls it all together. Now, what to do with those leftover fresh cranberries… make our wonderful Homemade Cranberry Sauce of course. Then again you could also make a jolly batch of Cranberry Apple Bourbon Cocktail , or you could make both. 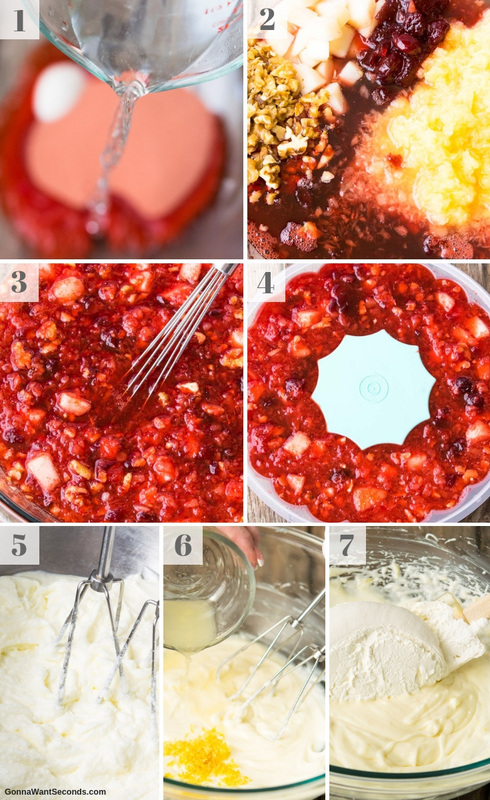 How Do You Make Cranberry Jello Salad? Prepare your cranberry pineapple salad in three basic steps. Prep time is just ten minutes! First, mix up your jello the way you normally would. Next, stir the fruity “salad” ingredients. Or if you’re using a different type of mold that doesn’t have an open center, you can decoratively mound some of the lemon cream on the top of the Jello and then pipe any extra cream around the base. If you want to keep it real simple, you can serve the lemon cream in a bowl next to the Jello salad. Garnishing really sets this salad off. I used fresh or Sugared Cranberries, a little lemon peel, and fresh mint. If this recipe has you hankering for more cranberry delights, you might like my Starbucks’ inspired Cranberry Bliss Cookies. 1. Spray a 9×9 baking dish or 6-Cup Jello mold with non-stick cooking spray. In a mixing bowl, unpacked jellos and gelatin. Pour boiling water and stir for 2 minutes until completely melted. Add cold water. 2. Add pineapple (with juice), cranberry sauce, chopped pear, and walnuts. 4. Pour into prepared mold and cover with plastic wrap. Refrigerate until firmly set. Before serving, invert the jello mold onto serving platter. 5. In a large bowl, beat cream cheese. 6. Add lemon juice, lemon zest, and 1 cup sugar. Beat until the mixture is smooth. 7. Fold the Cool Whip into the cream cheese mixture until just incorporated. Fill the center of the jello mold with lemon cream topping, or serve in a bowl on the side. 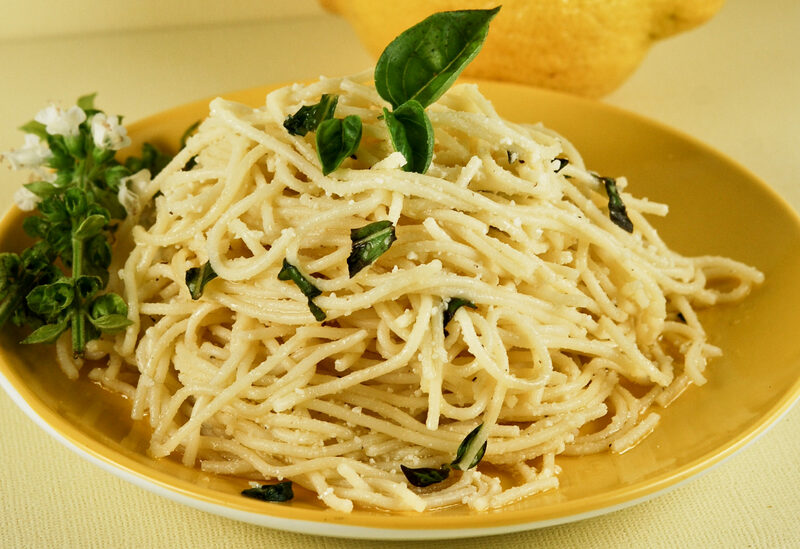 Garnish with fresh cranberries or sugared cranberries, lemon zest and fresh mint leaves. Spray a 9X9 inch baking dish or 6 cup Jello mold with nonstick cooking spray. In a medium glass mixing bowl, place both jello packages and unflavored gelatin. Add boiling water and stir continuously, for 2 minutes, until jello and gelatin are completely dissolved. Add cold water to the mixture. Add the pineapple along with juice, the cranberry sauce, chopped pear, and chopped walnuts. Stir mixture until evenly mixed. Pour into prepared mold, cover with plastic wrap and refrigerate until firmly set. 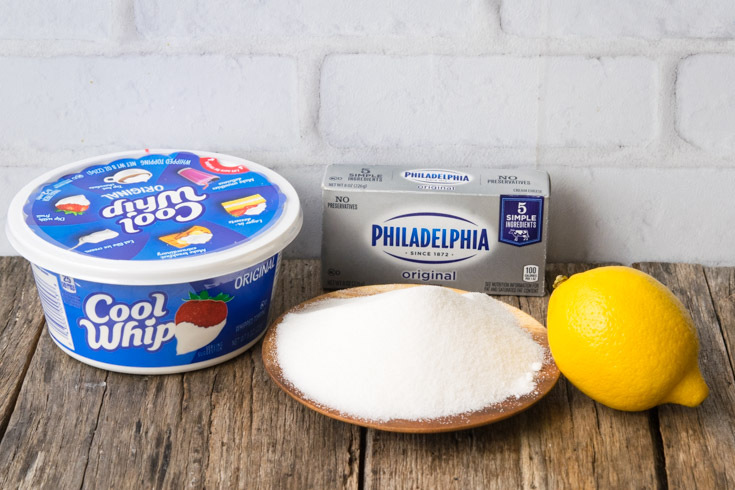 Meanwhile, in a large bowl, beat the cream cheese, lemon juice, lemon zest, and 1 cup of sugar until the mixture is smooth. Fold the Cool Whip whip into the cream cheese mixture until just incorporated. Refrigerate to until firmed up enough to neatly spoon into Jello center. About an hour before serving, invert the jello mold onto a serving platter. Allow it to sit and the jello will release onto the plate. Fill the center of Jello mold with Lemon Cream Topping or serve in a bowl on the side. Garnish with fresh whole Cranberries or Sugared Cranberries, lemon zest and fresh mint leaves. Weeping: As any jello salad comes to room temperature, especially in a warm room, it can potentially weep a little. 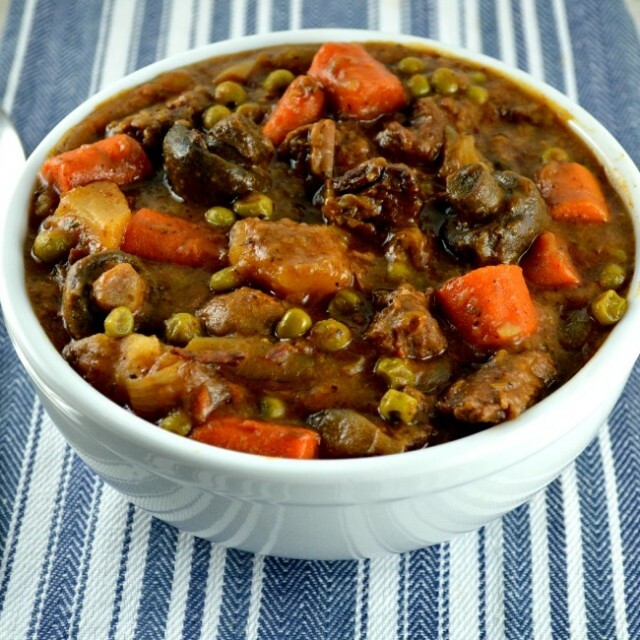 I like to serve this on a rimmed serving dish to make sure there’s no mess. To make it pretty, take a tip from all the grandma’s before us and place a layer of pretty ruffled lettuce under the jello salad before inverting from the mold to the platter! No one will ever notice if any weeping occurs! Chopping walnuts: If you are like me, chopping small, dense ingredients without the help of a food processor often results in more bits on the floor than on the cutting board! Try this trusty method. Grab a chef’s knife, group your walnuts together, and use a base to tip rocking motion to slowly work through the pile. Mold selection: As mentioned above, you can use a 9 by 9-inch baking dish if you don’t have a mold handy. If you prefer a swankier shaped salad, as long as the mold is a volume of 6 cups, you can’t go wrong. Maybe err on the side of a flatter shaped top, since you will be decorating it with dollops and berries. Jello selection: Cherry Jello is my personal favorite, but you can concoct a Raspberry cranberry jello salad that works just as well. If you want to get even wilder, try a package of black cherry jello! What to do if your jello splits: This shouldn’t happen if you allow your jello to set long enough. If you are having trouble removing it from the mold, try soaking the outside of the mold in warm water for about ten seconds, and loosening the edges with a knife. If all else fails, you can serve up your salad in fancy little cups! I promise it will taste just as great! Do a quick Pinterest search for pretty jello cups if you’re feeling discouraged. 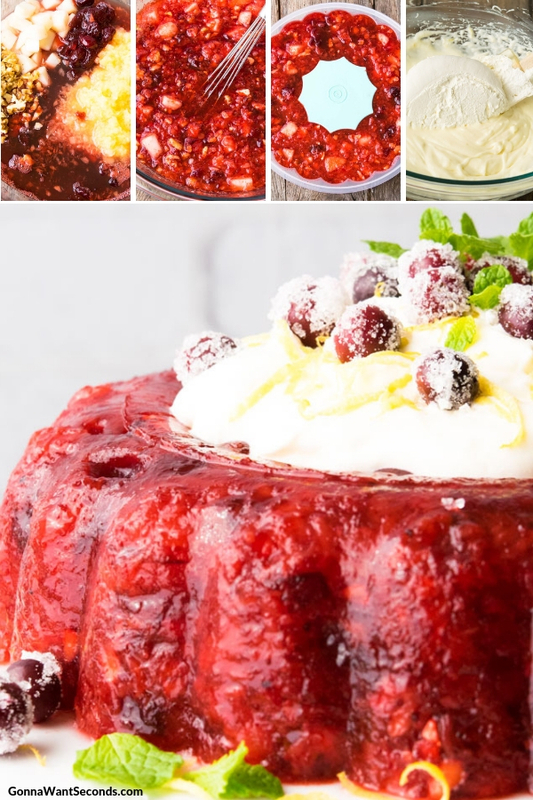 Topping variations: If you need a break from cream cheese for some crazy reason, cranberry jello salad with cool whip (cool whip alone, not as an ingredient as we use it in our lemon cream) and cranberry jello salad with sour cream are also delicious. Salad variations: Let’s talk about cranberry jello salad no pineapple. There is a rumor swirling around out there that putting this fruit in your jello will prevent it from setting. Let’s be clear: my zillions of jello salads through the years testify otherwise. You may have different reasons for omitting it though. Some folks just can’t abide pineapple, I get it! You are of course free to substitute another citrus fruit and make cranberry orange jello salad, for example. Can You Make Cranberry Jello Salad Ahead Of Time? You can make this salad over a week in advance, which is good news for those of you bracing for the holiday hustle. It will keep in the fridge for up to ten days. 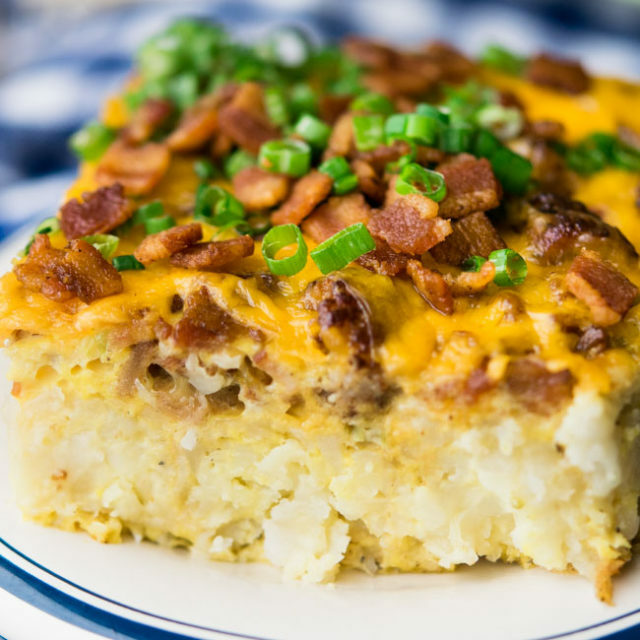 I would recommend holding off on preparing the topping until you are ready to serve so it remains fresh and stiff. How Do You Freeze Cranberry Jello Salad? Freezing jello destroys its texture, so I would not recommend preserving this recipe past its best by refrigeration date. Unless that is, you are planning to turn it into a smoothie later — in which case, have at it! A blender can work wonders on frozen treats with iffy textures. 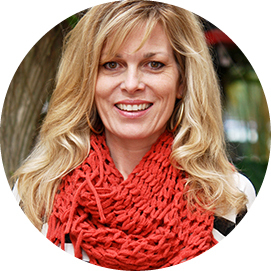 Oh Dee, thank you so much! I’m so glad you love our site. I’m so happy to have you with us <3 Jello salads bring back all sorts of happy memories for me too. Not gonna lie I’m not a huge fan of cranberries. I’ve only come across a couple of says that I will either eat or drink it. One it has to be mixed with something else in order for to want to drink it. Second the only edible form I like so far is something King Soopers wells called Cranberry Celebration. However this a really looks good and I’m willing to try this at least once before forming an opinion about it.